As part of its ongoing commitment to transparency, MarketInvoice has today published its loanbook on the AltFi Data website. The loanbook will be updated on a monthly basis in a similar fashion to those of RateSetter and Zopa. You can find it here. Also Madelyn Puente, Head of Investor Development at MarketInvoice has written a blog post on the value of transparency, illuminating the reasons why MarketInvoice have made this commitment to transparency. You can read her article here. We’ve been lucky enough to have a sneak preview of the loanbook and have put together a few highlights to help those readers who have better things to do than play with data all day! One of the most exciting things about MarketInvoice’s loanbook is the number of transactions that it has completed and the size of this number compared to the total transactions carried out. 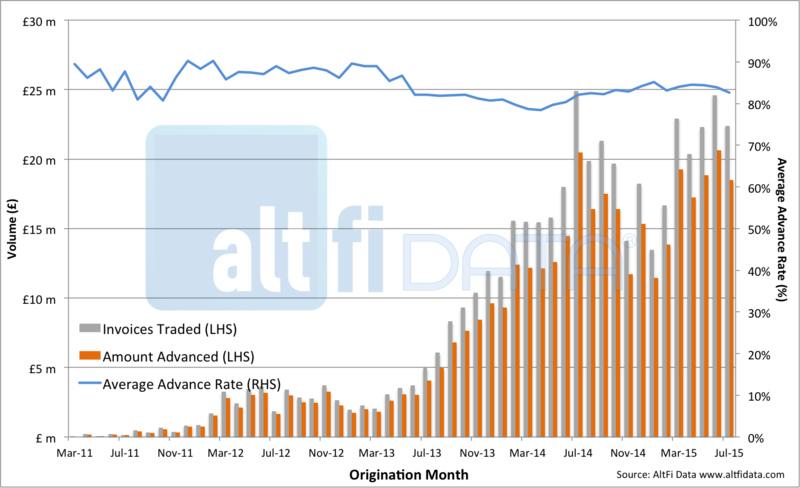 This is due to the average term of its invoice trades being just under 42 days (see Figure 4. ), significantly shorter than non invoice finance lending platforms. Figure 1. below shows the number of loans originated and completed successfully for the UK’s top four platforms. 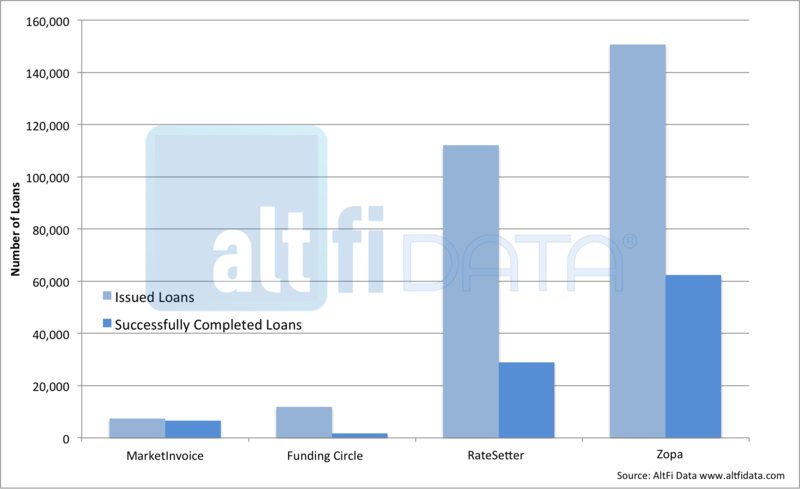 Figure 1 – Number of loans successfully completed by the top four platforms. MarketInvoice has almost 4 times the number of completed transactions as Funding Circle. Indeed, we believe that MarketInvoice has the biggest number of successfully completed P2P business loans in the UK (and probably the world). There is a huge amount that can be learnt from the loanbook without the need for assumptions and any modeling of the future. Most platforms are on the 2nd, 3rd or even 4th iteration of their credit model. Lending practices also evolve – for example Funding Circle’s introduction of a new risk band, RateSetter’s move into business lending and Zopa’s move to a more diverse borrower mix. It is hard to model these changes accurately to predict the future. For a platform that makes 3 year loans, 2 years may pass before the effectiveness of the credit process is fully understood. For MarketInvoice, the validation, or otherwise, of its credit decision takes a little under 42 days on average to materialise! Figure 2. Invoices Traded and Advance amounts. The loanbook enables us to observe not just the volume of invoices traded through MarketInvoice but also the amount lent against those invoices (the Advance Amount). We can see from Figure 2. that the average advance rate has remained fairly constant at around 80% recently, having come down from 85% in MarketInvoice’s first few years of operation. All things being equal, a lower advance rate is less risky for investors. The amount of investor money deployed through MarketInvoice’s platform at any one time is surprisingly low at just under £28m when compared to MarketInvoice’s cumulative volume. Funding Circle currently has over half a billion pounds of principal outstanding. However, when one considers that MarketInvoice recycles investor’s capital around 8 times a year, this disparity in principal outstanding makes more sense. Figure 3. Mean and median loan size for the UK’s four biggest platforms. Figure 3 shows the mean loan size for MarketInvoice to be just over £51,000. The median, however, in a similar way to that of RateSetter, is much smaller. 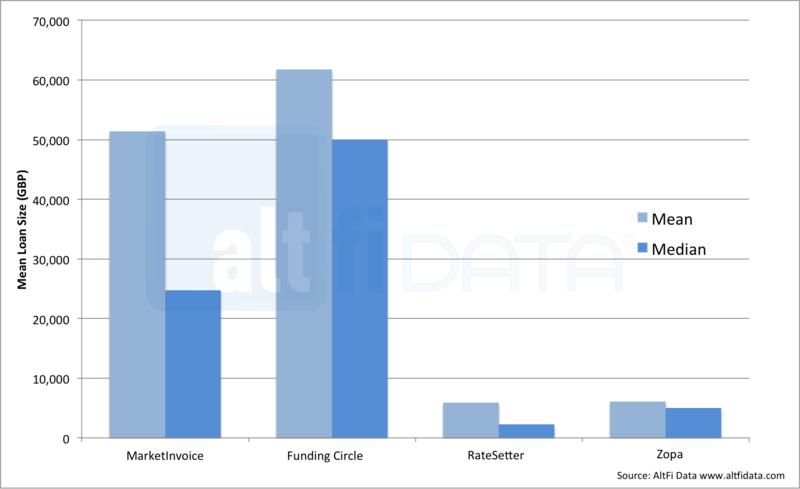 This difference indicates that the distribution of loan size is much larger for MarketInvoice than for Funding Circle or Zopa. Figure 4. Distribution of loan term. 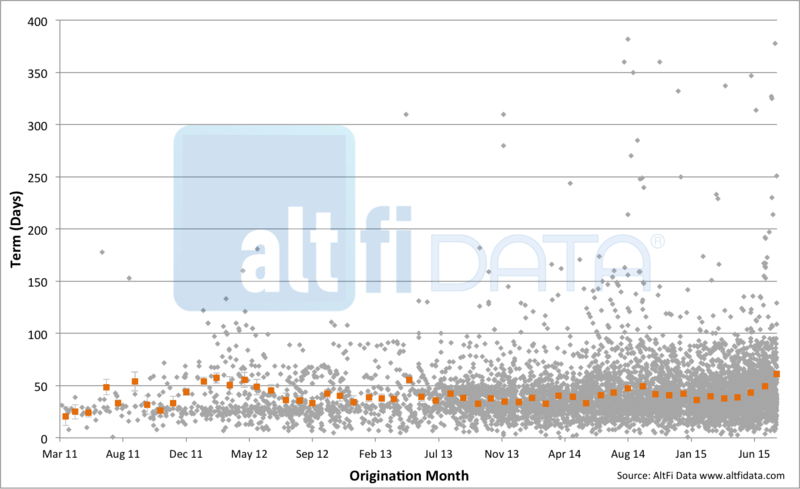 Orange markers indicate monthly volume weighted mean. The average loan term since the platform launched is just under 42 days, but as can be seen from figure 4, the term has increased over recent months, moving closer to 50 days. The length of some of the outlying trades is surprising with the shortest term being 1 day and the longest recorded as 382 days! Figure 5. Distribution of gross loan yield. 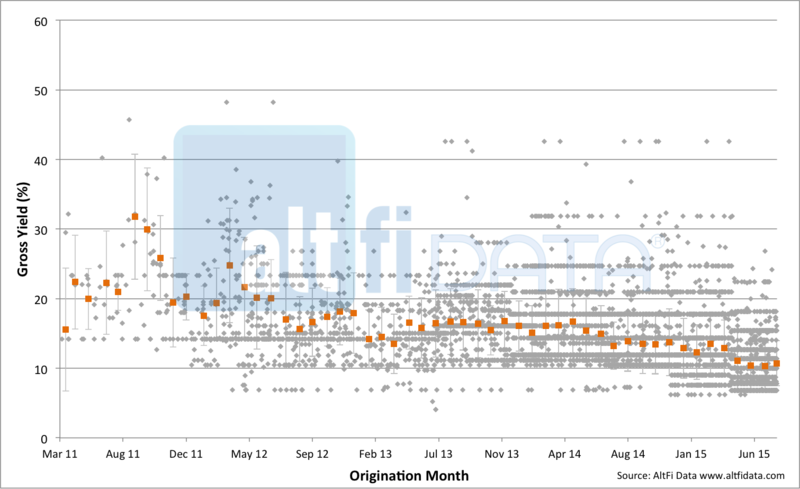 Orange markers indicate monthly volume weighted mean. The gross yield for investors has trended downwards overtime. In the early days investors could expect 20+% on average but now 10% seems to be the norm as can be seen in figure 5. This could be a result of strong investor demand putting pressure on yields as the model matures and is better understood. But we are also told that MarketInvoice is now financing a broader spectrum of invoices including some that are much lower risk, large corporate-to-large corporate invoices. It is worth bearing in mind that investments with MarketInvoice are secured against the invoice. Gross yield is only half the story when considering an investor return. What about loss rates? 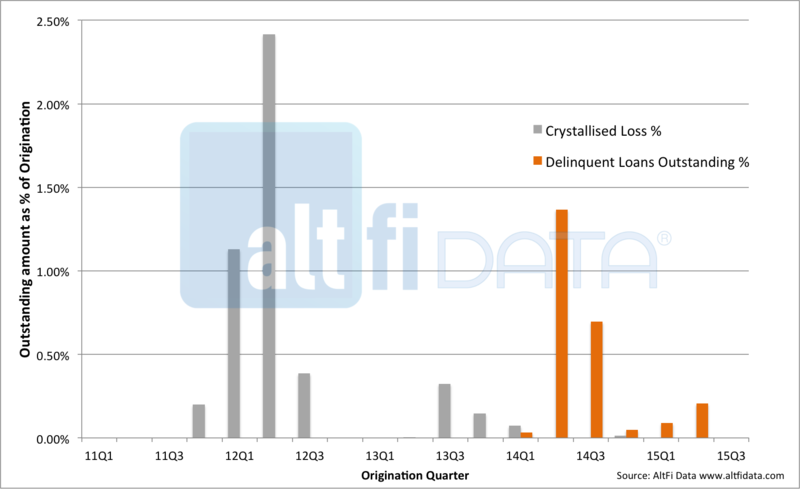 Figure 6 shows crystallised losses and delinquent (>45 days late) loans as a percentage of origination by quarter. Note that there are several quarters with no losses at all. The crystallised loss rate life to date is 0.11% and there is currently 2.87% of oustanding loans that MarketInvoice terms as being "In arrears", or delinquent. Due to the secured nature of MarketInvoice's product, historically the vast majority (95%+) of delinquencies have successful outcomes and do not go on to become crystallised losses. Pretty impressive. MarketInvoice's fees, on a percentage basis, are higher than most platforms (between 20 and 30% of investor profit), this is because of the high number of short duration trades, which each carry a fixed processing cost despite MarketInvoice’s heavily automated process. Cash Drag. Again due to the short term nature of each trade, investors’ cash can, on a percentage basis, remain uninvested for a longer amount of time than on a platform where money is invested in, say 3 year loans. This means the overall gross interest rate on all money deposited with MarketInvoice is lower. We cannot get a feel for the magnitude of this effect from the loanbook but we are told that on average between 75% and 85% of money deposited on the platform is deployed at any one time. The above yield analysis is a somewhat qualitative analysis backed by numbers. For a more thorough analysis, we are very pleased to say that MarketInvoice’s introduction into the Liberum AltFi Returns Index is imminent. "An average return of 6.5% net of these things." - this is too low for this type of product with these risk/return metrics. @Peter S MarketInvoice has an excellent track record of delivering returns (net of fees, deployment and losses). So far this year, investors have seen an average return of 6.5% net of these things. We do require insurance to cover fraud cases (the above figure is also net of charges for insurance) - this is something we brought in last year after undergoing consultation with lenders on the platform. MarketInvoice has an outstanding record in default recovery (way ahead of invoice finance industry average). Since inception, of all defaults on the platform we have a recovery rate of 88%. Recovery measures are managed in-house in order to keep costs as low as possible. Like almost all other peer-to-peer lenders we do not provide capital on our platform. However there is a great incentive for us to generate returns for investors; we publish clear statistics relating to investor returns and losses on our website, and we also publish our live loanbook for anyone to investigate. So if we were not delivering for investors that would become clear very quickly and our business would not be able to operate successfully - a pretty big incentive! It's also worth remembering that MarketInvoice is providing access to a secured, highly liquid asset class - so we're very proud of our risk/return profile. Marketinvoice has a high fee, charges mandatory insurance and involves extended periods of undeployed capital - all combining to significantly reduce net returns. This is before the significant defaults are taken into account. Recovery actions are costs to the investor so there is the possibility of losing greater than 100% of the amount invested. MarketInvoice is not directly incentivised to pursue delinquent investments as Market Invoice has no capital at risk, further compounding the issue. Net net, an investor would be lucky to achieve greater than a 6% net return, with potential for much lower. Thanks for the pointer, now corrected! Thanks - interesting. You have got LHS and RHS reversed in the 2nd chart.